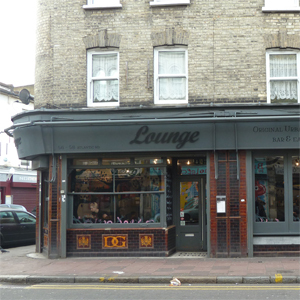 Lounge is one of those places that isn’t clear what it is – is it a bar, a cafe or a restaurant. Well it is all three. Orange walls and art with small tables and asorted chairs so the decor is as confused as its mission. The art changes regularly and the pictures on the website are more attractive than those currently on display. Oil paintings of faces that look like they are made of carpet …… well we didn’t like it. But back to its mission – even though it is confused this adds to the charm as you can drink a cocktail, eat scrambled egg (before 5.30pm) or a hamburger later in the evening. We chose Lounge as a quick eat before the Ritzy. We ordered a beer and a lounge martini. This was nothing like a martini except in the shape of the glass. The recipe includes: grand marnier, bourbon and fresh lime – promising but much too sweet. We ordered a jerk chicken burger and slow cooked lamb – both passable and reasonably quick but we were a bit twitchy about missing the trailers. Prices ….. cocktails about £6.50, main courses £6 to £9 so a meal with a drink can cost about £15 per person.